In another age I might have had to prostate myself in front of the samurai warriors mounted on their steeds. But, this was the 21st century and I was a tourist cheerfully snapping pictures as the single column of “warriors” riding their colorfully decorated thoroughbreds passed by. Seeing the mounted samurai for the first time. 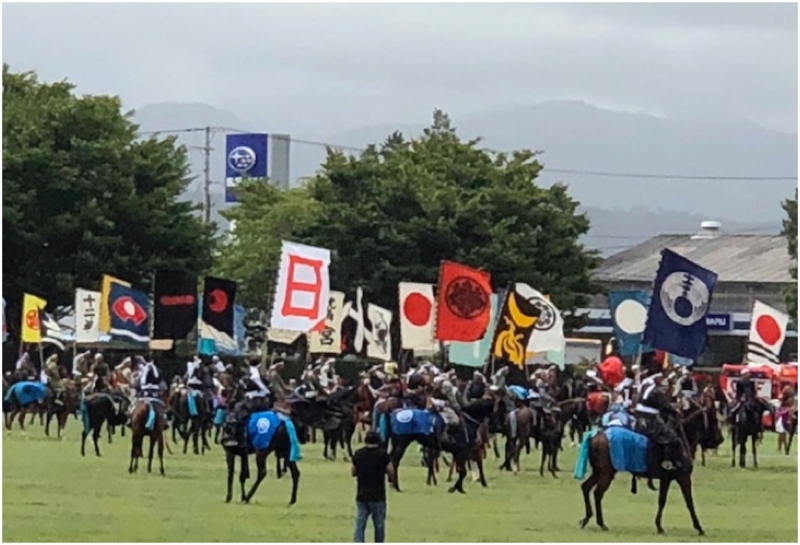 I had journeyed from Tokyo to the northern part of Fukushima Prefecture to see the Soma Nomaoi Festival, which began as a feudal military exercise more than 1,000 years ago. 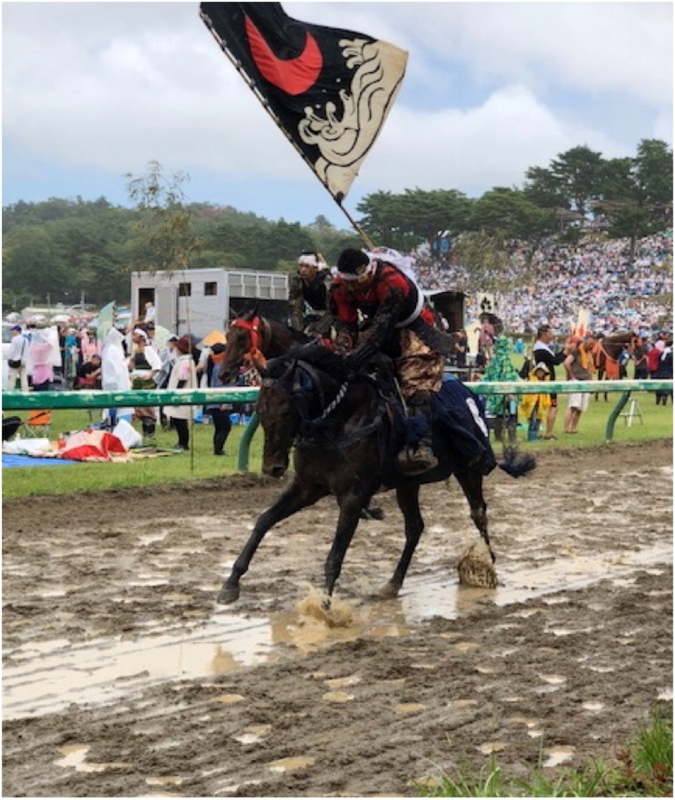 A horse race featuring men (and a few women) dressed in full traditional samurai armor held on the second day is the highlight of the three-day pageant that takes place in the city of Minami Soma and surrounding areas. The armor, made of leather, bronze and iron, can weigh up to 20 kg. The procession of samurai warriors I saw on the first day had just completed a formal ceremony known as shutsujin-shiki, or “departure for the front,” at a local shrine called Oota Jinja. Similar ceremonies were held at two other shrines in the area. Under an overcast sky, the mounted men – in kimonos but not yet in battle gear — proceeded along a path that cut through verdant green rice fields. The rhythmic clip-clop of hooves and the occasional neighing of horses enhanced the mood of the bucolic scene. On the way to the battlefield. Even the devastating Tohoku earthquake of March 11, 2011 and subsequent meltdowns at the nearby nuclear plant did not stop the festival from proceeding just a few months later, although certain events were cancelled. Some key areas traditionally used as venues for the festival are located only a few kilometers away from the nuclear plant. Seven years have passed, yet some of these venues remain contaminated and are off-limits to the public. . 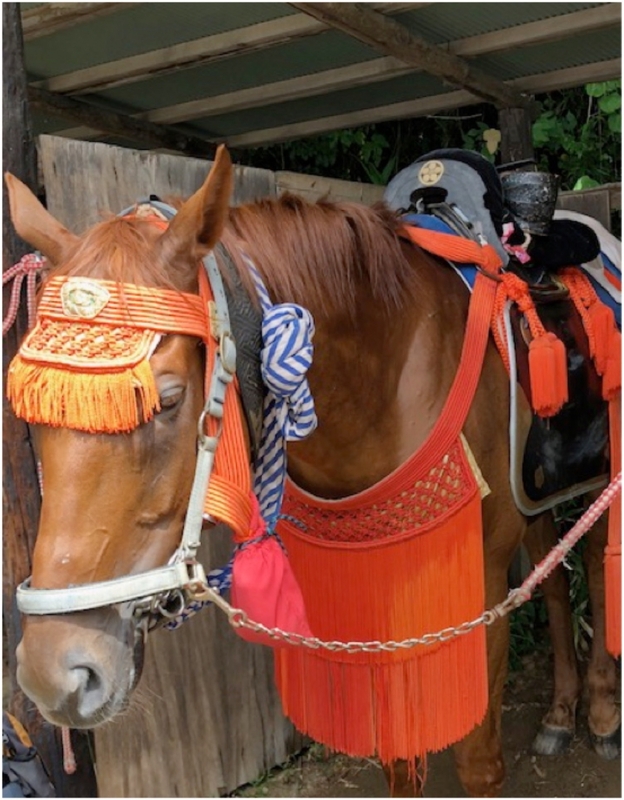 The Soma Nomaoi festival, held on the last weekend of July, is the main tourist attraction here. 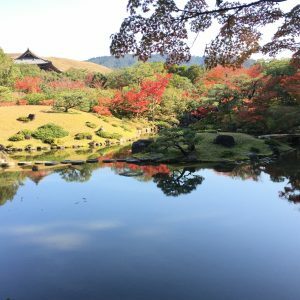 For the rest of the year, Minami Soma is an unpretentious city in northeastern Japan, close to the Pacific coast. As such it has few lodgings for visitors. 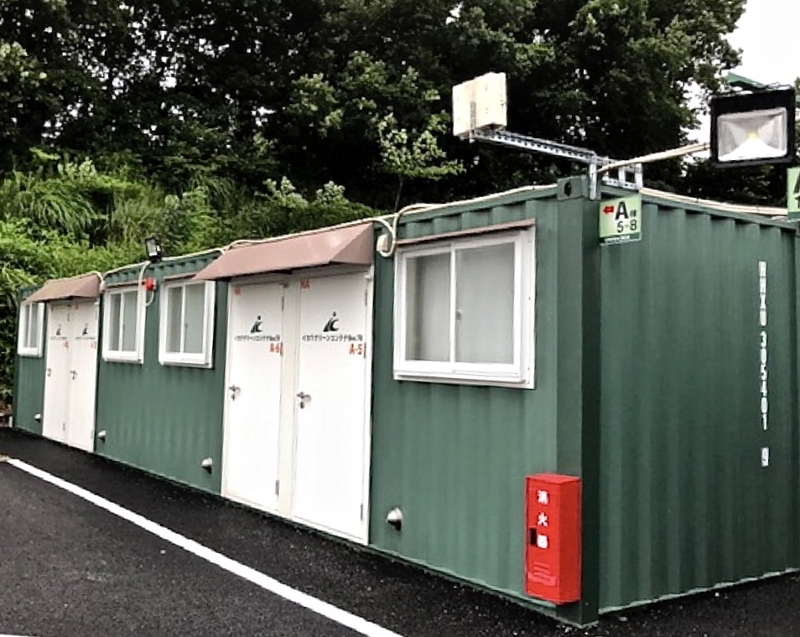 My friends and I stayed at a “hotel” housed in converted shipping containers. It was a no-frills, compact form of accommodation that contained a single bed and a modular bath and toilet. The room with one tiny window was admittedly claustrophobic, but it was clean and ideally located, within walking distance to the venue for the festival’s main events. It was also cheap at 4,500 yen a night. And for an extra 1,000 yen you could have dinner and breakfast. The meals were surprisingly good (particularly in light of our very low expectations). When we complimented the “chef” – clearly an enthusiastic local — on the grilled fish he served up for breakfast, he grinned and said it had come frozen. In retrospect, I suspect most of what we consumed during our stay came from the freezer, except for the excellent rice, for which northern Japan is famous. Three events are held on the second day of the festival. 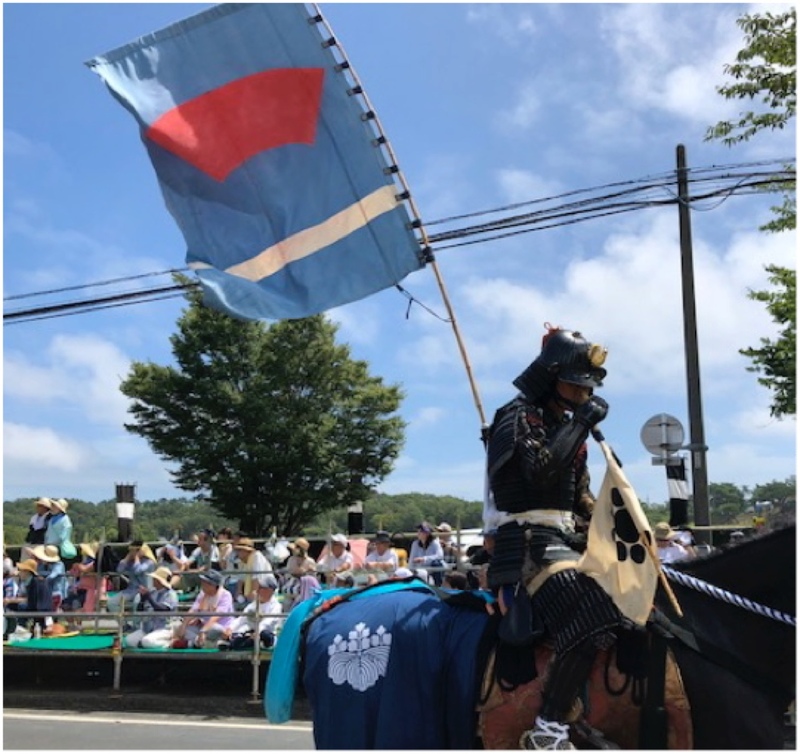 First, the procession of mounted warriors (ogyoretsu), now dressed in battle gear, passes through the city’s thoroughfare to Hibarigahara, an open field that is normally used as a stadium for track events. 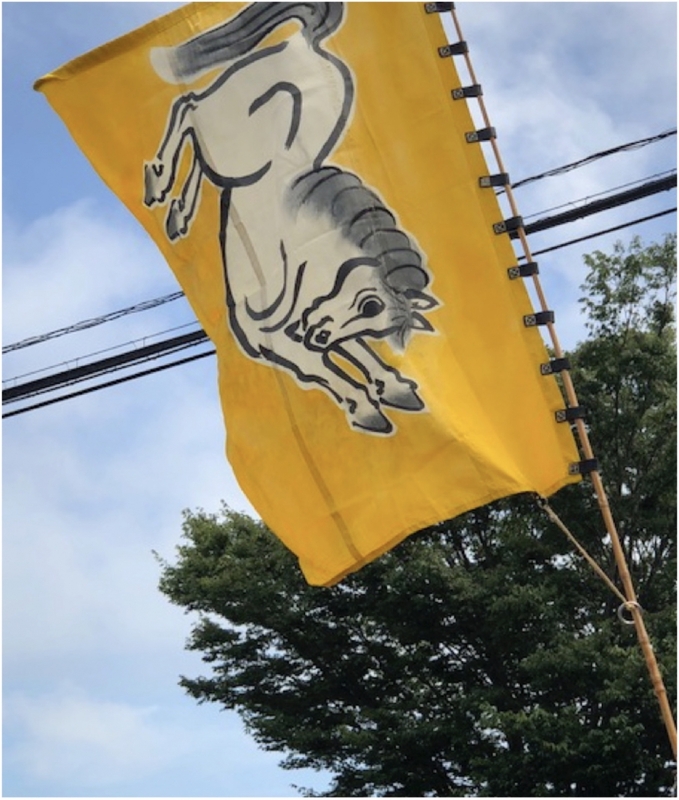 This is the venue for the remaining two events and the highlight of the festival, a horse race (kacchu keiba) and a competition among mounted samurai to grab the sacred flag (shinki sodatsusen). Creating an appropriately festive atmosphere, double and triple rows of onlookers lined the street as the parade of mounted warriors passed by. Every so often, a samurai warrior would spot a familiar face in the crowd. His dramatically stern face would break into a wide grin and he would lift his hand in greeting. 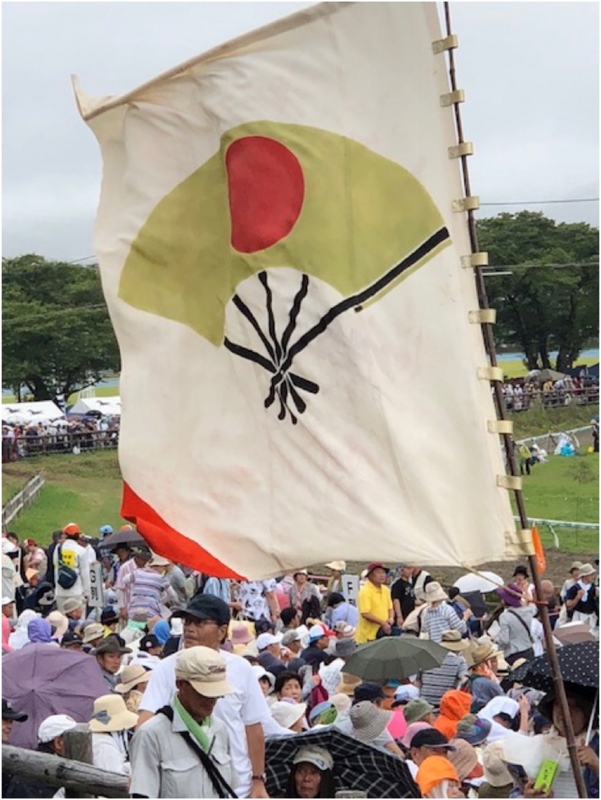 Just like the period samurai dramas one sees at the cinema or on TV, colorful banners fluttered from long poles attached to the samurais’ backs. No two flags were the same. That is because the flags, about a third of the size of a single futon mattress, were meant to help the feudal lord identify his warriors from a distance. Some flags were printed with abstract designs, others with objects of worship such as stars. Others displayed colorful pictures of animals, both real and mythical. Alongside the novelty of the mounted riders, the visual feast of color and images in the flag procession was in itself fascinating. A brightly colored flag with an abstract design. The distinct colors help differentiate the flags. The bold design makes this flag readily identifiable. 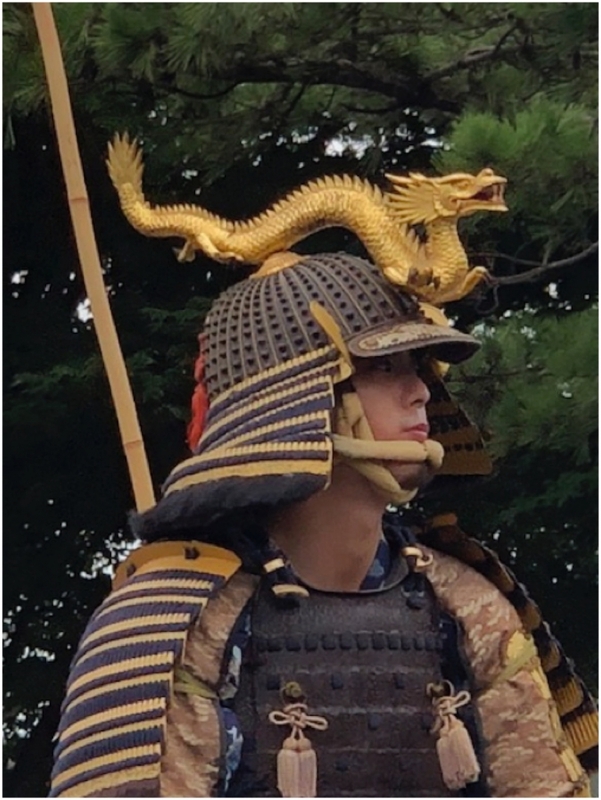 It was a thrilling spectacle that brought to life a chapter in Japan’s history when battles were regularly fought among expansionist warlords. Each warrior wore a helmet with distinct decorations. Their expressions were resolute, their backs were straight and their hands were steady as they held the reins. A young warrior all decked out in fighting gear. The tragic Fukushima earthquake and tsunami caused the deaths of nearly 20,000 inhabitants in the Tohoku region. In Minami Soma the toll was over 1,100 people. The tsunami also swept away horses, armor and other accessories essential to the festival. Many of the participants kept their own mounts before 2011, now some of the horses are borrowed for the occasion and are actual racehorses. The disastrous events of 2011 continue to cast a shadow over the festival in many ways, not least because some of the participants remain displaced and are still living in “temporary” housing. 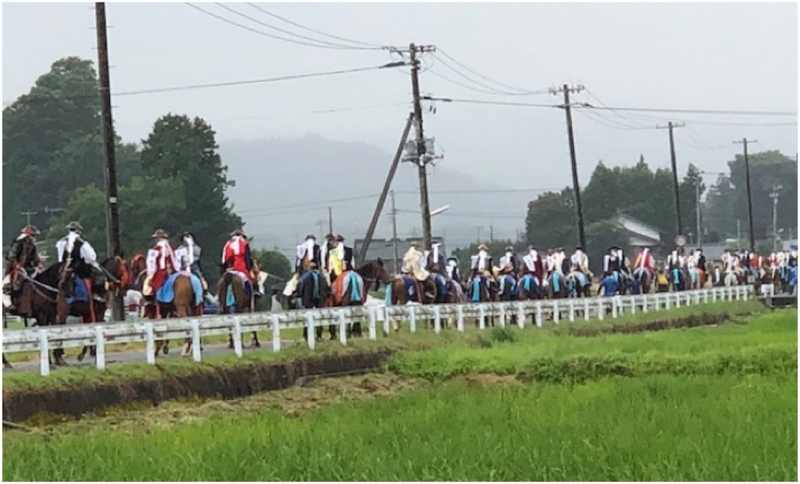 This year, about 430 men and women on horses took part, about the same number as before the earthquake. And like earlier times, the featival drew a crowd of about 35,000. As with all public events, not all locals wholeheartedly welcomed the festival. 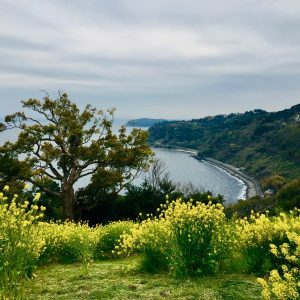 An anonymous citizen posted a complaint on Minami Soma city’s official website about the litter in the streets which included uncleared horse droppings and cigarette stubs. This irate citizen said it should be publicly acknowledged that taxpayers’ money was being spent to help host the festival. 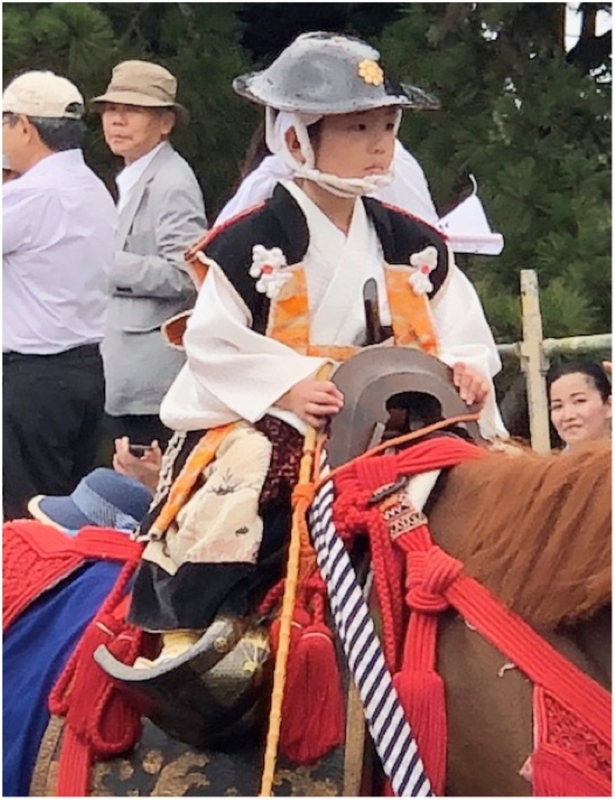 There were also a small number of children, both girls and boys, of about kindergarten age perched on horses alongside adult riders in the column. They wore appropriately solemn expressions and seemed unafraid as they rode on the same thoroughbreds as the adults. They were the darlings of the crowd. At the racecourse, a crowd of spectators sat on tarpaulin and other sheets placed on ground that was soggy from sporadic showers. But the mood was festive amid high excitement. Eager to capture the action on camera I chose to wander around the racecourse rather than sit in the stands that had been assembled for the occasion. I squeezed between amateur photographers who stood shoulder-to-shoulder along the racecourse fence, at a bend where we could take close-up shots of the riders. A horse taking a break. Gathering to grab the sacred flag. 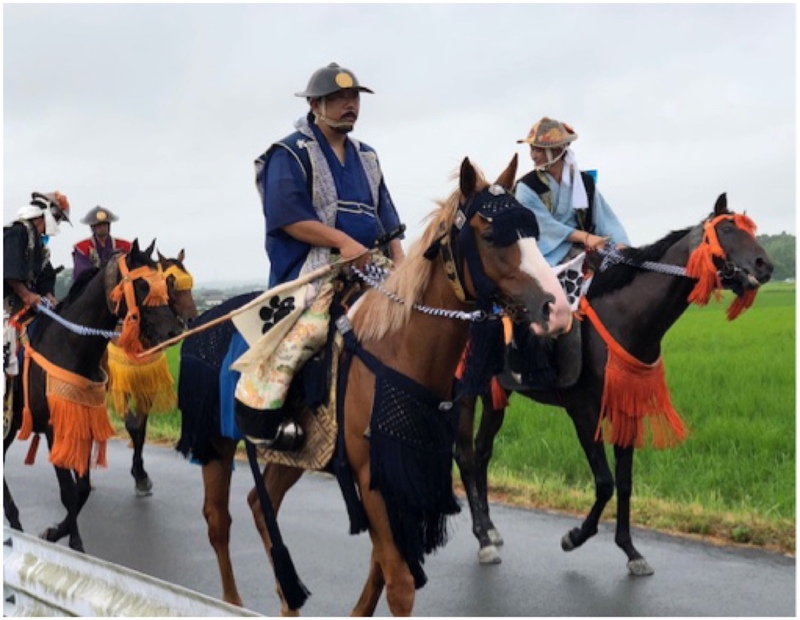 Unfortunately, I was unable to attend the festival’s third and last day, when men dressed completely in white try to capture barebacked horses (nomagake). 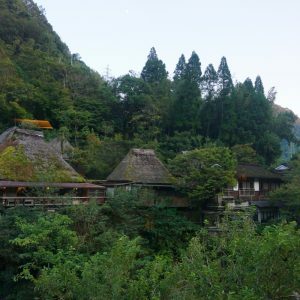 Even so, attending the Soma Nomaoi festival at long last enabled me to tick the event off my bucket list, and opened up the possibility of a second visit some day. As a child, I used to enjoy watching swashbuckling Japanese historical dramas on TV. The Soma Nomaoi Festival is the closest I will ever get to the spirit of those bygone days, which I now realize are not half as romantic as my fanciful childhood imagination. The Soma-Nomaoi Festival takes place on the last Saturday to Monday of July.